If It's Too Loud...: Vital Idles - "A Premise"
The newest single from Glasgow's Vital Idles is a little too primitive to be post punk, but it's nearly perfect. "A Premise" is filled with both guitars and vocals that drone off just slightly off tune enough to be interesting. Jessica Higgins's voice is front and center over an almost barely heard and incredibly fuzzy bed of instruments. It's a little too full to be truly minimalist, but it's as filled out as you can get and still be considered minimalist. It all clocks in at 1:45, which will leave you needing more but satisfied that it's such a perfect length. You can listen to "A Premise" below. 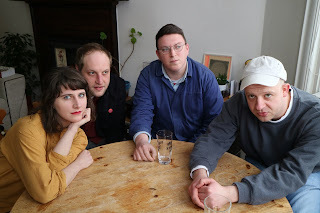 Vital Idles's debut album, Left Hand, will be out June 1 on Upset The Rhythm. You can pre-order a copy here. Fore more on Vital Idles, check them out on Facebook and Bandcamp.